Hello lovelies! Who's ready for the weekend?! I know I am. We are finally ushering out the sick germs around here and I hope they stay away. We had a lovely taste of spring this week, after a beautiful snowfall last weekend. It was a wacky weather week, but we did our best to get out and enjoy both the chilly white snow and the balmy sunshiny days. 1. Little Miss took her first sled ride. We only got 2-3" but it was enough to play in. 2. We took a family trip to Starbucks for some toasty beverages. 3. 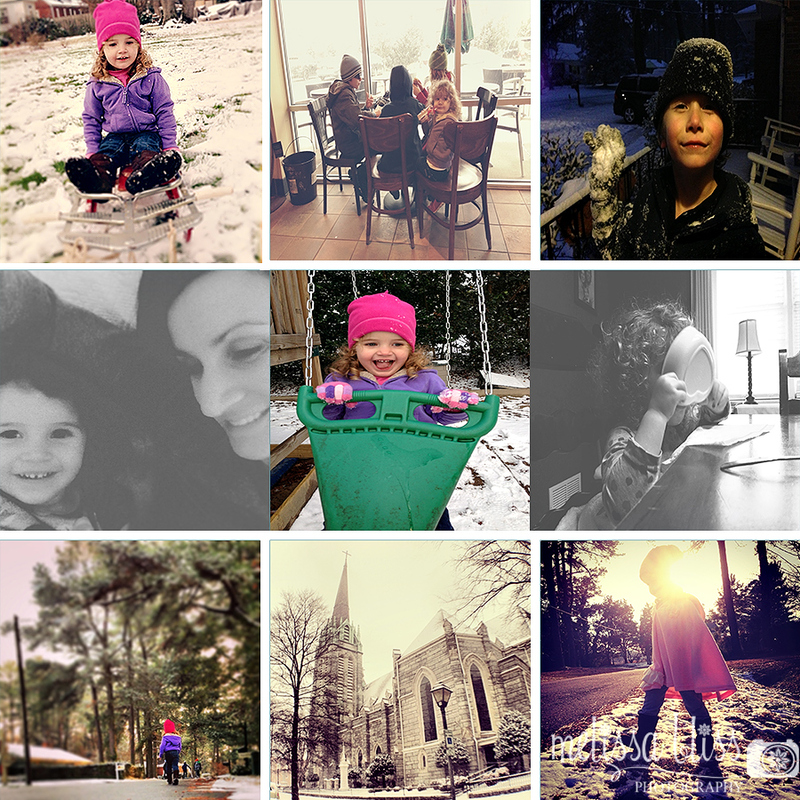 The snow only lasted about 2 days so the kids played out until dark to make the most of it. 4. I was getting some sweet snuggles from my little girl. Dreading the day she leaves my lap. 5. Swinging in the snow. 7. Chasing the kidlets down the street. 8. We ventured into olde town to see it topped with snow. 9. Another stroll around the neighborhood in the setting sun. That's it for me this week. What have you been up to? I love catching up on your news. Thanks for visiting! Ooh, la, la, love those last three, and what an awesome sun flare in the last one! Such a fun week for you all...minus the sickies! Starbucks looks fun! What a treat! Sounds like the perfect week!! A little taste of winter and then some warm temperatures and sunshine!! What a picture ... the one of your curly beauty drinking her milk from her cereal bowl!! Sweet!! oh the sick germs have not struck out house (I'm almost afraid to type that). My daughter told me this morning that her throat hurt, so I think they are coming. What a wonderful snapsot of your week, Melissa. I absolutely LOVE "Slurp." Such perfect timing on that one. The black and white church is beautiful and serene...great capture of the children playing too! thanks for another party. I am your newest follower. Love all of them, but 7 is my fave:) Have a great weekend. What a fabulous week you had- the snow must have been so much fun! What a crazy weather week it has been!! Looks like it was a fun one! Those are some happy winter faces! thank you so much for your kind words on a post!! We moms and our guilt!